And I thought the grammar on the back of the Topps cards were bad. Man, Upper Deck, which was so hot in 1990, really flubbed this one. There are so many missing words in this that it’s ridiculous. How hard would it be to write: “West was key part of 5 pitcher deal to the Mets for Frank Viola. He was drafted #4 by Mets in June ’83.” And, by #4 they mean a fourth rounder, not that he was the fourth overall pick. So he wasn’t as big of a bust as you would surmise. He did spend 10 seasons in the majors, finishing with a 4.66 ERA, 1.47 WHIP and 1.41 K:BB rate in 569.1 innings. 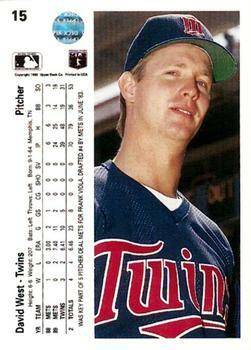 He had one decent year for the Twins, in 1991, when he started 12 games and finished with a 4.54 ERA and 1.32 WHIP. He really helped the Twins get to the World Series that year, as he threw 5.2 innings in relief in the ALCS without allowing a run. Of course, his World Series was terrible, as he finished with an ERA of infinity (he allowed four runs without recording an out). Two years later, he had arguably his best season (2.92 ERA, 1.29 WHIP and 1.71 K:BB) for the Phillies. Thanks to Mitch Williams, his utter relief failures are not as heavily remembered. In the NLCS, he allowed five runs/four earned in 2.2 innings and in the World Series, he allowed three earned runs in just one inning of work. He made well over $2.5 million in his career, tasted victory and defeat and even played in Japan. Still, he was by no means the key part of the Frank Viola trade (at least in hindsight). In addition to West, the New York Mets sent Rick Aguilera, Tim Drummon and Kevin Tapani to the Twins. Adding in those elements makes this not a particularly astute move by the Mets (but what else is new). While West was worth -0.3 WAR for the Twins, Aguilera was worth 16.1 WAR, Drummon was worth 0.7 WAR and Tapani was worth 17.5 WAR. At the time of the deal, Aguilera (who has an awesome beard) was 27 and owned a career 3.58 ERA and 1.29 WHIP for the Mets over 473 innings. Aguilera was especially valuable in 1991, posting a 2.35 ERA with 42 saves and a 1.07 WHIP – heck he even received some MVP votes. He also threw 8.1 innings in the play-offs, earning five saves and allowing just one earned run. Tapani also turned in a banner season in 1991: 34 starts, 244 innings, a 2.99 ERA, 1.09 WHIP and 3.38 K:BB rate. He finished seventh in the CY Young voting, but you could make the argument that he deserved to be top four, at least. Tapani didn’t fare so well in the 1991 ALCS, getting shellacked by the Toronto Blue Jays. But he redeemed himself in the World Series: he started two games, pitched 12 innings and went 1-1. That’s a blueprint for building a championship there. The Twins gave up one decent starting pitcher who was near 30 for a bunch of younger cheaper pieces. So what about Viola? At the time of the deal, Viola was 29 and would be worth 9.6 WAR for the Mets. He was effectively done after 1993, just four years after the deal. Still, he had a fantastic career. He gave up the 3,000th hit to Rod Carew in 1985. When it was all said and done, Viola started 420 games, the 27th most in baseball history by a southpaw. He won 176 games of those games, the 43rd most by a lefty. Of course he also lost 150 games, tied for the 34th most by a southpaw (with Hal Newhouser and Ken Hotlzman). Viola finished with 1,844 Ks, the 26th most all-time by a lefty. Not bad. I always love looking at these types of deals – it seems that giving tons of young cheap talent for near-30s “stars” comes back to bite the team giving the young talent more often than not. Still, you have to give the Twins credit for dealing Viola who had just helped them win a World Series two years before.